It is estimated that over 80 billion dollars is spent because of back pain each year, and the cost is growing. Eight out of ten people will have a problem with back pain at some time during their lives. Back pain is more likely to occur during the ages of 30 to 50, the most productive period of most people's lives. Most episodes of low back pain are self-limited, meaning that they will resolve no matter what the treatment is. But, in some people these episodes of back pain can become chronic, meaning that they do not go away. Most people with low back pain do not simply injure their back suddenly. Over many years your back is subjected to repeated stress which may not result in pain at the time the injury to the parts of the spine actually occurs. These repeated injuries add up, and can slowly cause degeneration of the parts of the spine and low back pain. Most episodes of low back pain are at least partially the result of degenerative changes that have occurred in the back over many years. There may be an acute injury that causes your back to begin to hurt, but the overall condition of the lumbar spine is also very important. The overall condition of the spine usually determines how fast you will recover and the risk of the condition becoming chronic. This back pain relief device promises restorative relief. A breakthrough in the symptomatic relief of lower back pain. Soleve™ Noninvasive Targeted Neurostimulation (NTN) is a completely noninvasive, drug and steroid free, back pain relief device that's been shown in a promising pilot study to deliver lower back pain relief in as few as four sessions for 95% of patients.1 FDA-cleared and European CE mark-certified, the Soleve™ NTN back pain relief device applies electrical stimulation over multiple localized points across the back to provide soothing relief to sufferers of chronic lower back pain. An advancement in second-tier pain management. fills the gap between more low-intensity, less-effective procedures on the one hand, and more invasive, riskier third-tier procedures and the other. A progressive “step approach” for the treatment of chronic back pain is universally accepted and endorsed by the CDC.2 This approach suggests the patient begin treatment with less intense, less complex first-tier therapies before progressing in a “step approach” to more complex and ultimately more invasive therapies, if necessary. Click on the eHealth Radio Network Logo to hear more about Soleve. A revolutionary technology available in our Bradenton Office. A trained therapy professional and the advanced medical device do all the work. It’s painless, convenient, and fast-acting. 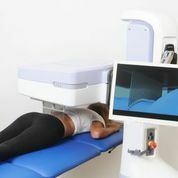 During treatment, just lie face down on the comfortable, padded treatment surface. An array of miniature probes, that touch but never enter the skin’s surface, scan the back to determine the areas of low skin impedance. High-intensity, multiphasic energy bursts stimulate nerves at the identified Active Trigger Points (ATPs) on the back.